J.K. Rowling’s new novel, The Casual Vacancy, hits shelves (and mailboxes) today, and I’m going to bet it doesn’t take very long at all before the LibraryThing reviews start appearing. We figured it was a good time to have another review contest! We did this before when Breaking Dawn and Harry Potter and the Deathly Hallows came out, and it was great fun. Three reviewers will get a $50 gift certificate to Amazon, Abebooks, or any independent bookseller of their choice, a LibraryThing t-shirt and a free lifetime membership (to keep or give away). Seven reviewers will will win a LibraryThing t-shirt and a free lifetime membership (to keep or give away). That’s right, there will be FIFTY winners. The top three reviews—with the most thumbs-up—will get the big prize. The next seven will get the next prize. The remaining forty winners will be randomly picked from all members who both wrote a review and voted for others’ reviews. So, when you finish reading, get writing! When you’re done writing, take some time to read other reviews, and give the thumbs-up to the ones you think deserve it. The contest ends on Friday, October 19th Tuesday, October 30th. Have fun! We’re also assembling the published reviews for The Casual Vacancy as they roll in. See this thread for discussion. Warning: don’t read these reviews if you don’t want to see spoilers. This book along with several other new releases was in my supermarket new book section at a 25% discount; so I took the opportunity to browse it. Reading the publisher blurb and then here and there in the massive text, I am not sorry to say that it is little different from most other novels. If it were shorter it might not be so bland and boring. this book is on my wish list and i would be thrilled to win this!!!!! The only thing “adult” about this book is the filthy language. Still primarly teens and their relationships with parents and society. would not recommend it to anyone unless they needed to get a fire started. 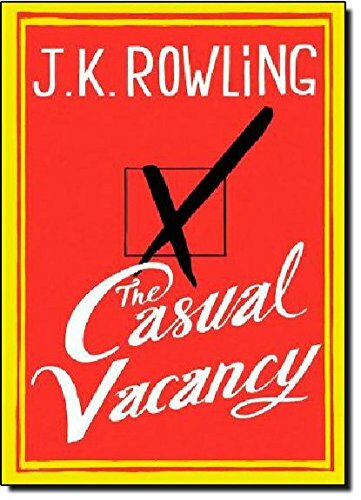 Please send me a review copy of Casual Vacancy and enter me into the giveaway contest. Unfortunately we don’t have review copies to send, but we certainly encourage you to enter! This book deals with a lot of social issues some of them current, like the rise of cyber bullying amongst teenagers and the potentially devastating effects it can have on people already struggling with self-esteem issues. But some of the issues are more perennial like the problems of domestic violence, or the way that the mental illness of one member of the family can effect the whole family. It looks at the problems of racism and sexism and how ‘outsiders’ of any sort are dealt with in society. The fact that this is a small town where everyone know everyone makes these ugly features of life more stark, but it is just showing that Pagford is a microcosm of the world at large. The more I read this book, the more I wanted to read. It pulled me into the narrative so that even when I had to put the book down for any reason, I could help but think about all the characters that I had met. I can’t say that I necessarily liked all the characters, but they are all so well drawn and recognisable that I couldn’t help but be compelled to read on and find out what would happen next. There is a part of me that wishes that J.K Rowling had released this book under a nom de plume. I fear that because it is so different from the world of Harry Potter that it may struggle to find its own way in the world. This book is excellent, and one of the best books I’ve read in a while, it has themes and concepts reminiscent of books like When God was a Rabbit, Black Swan Green or Capital, but it runs the risk of being ignored by fans of literary fiction- because they don’t expect that from Rowling, and disappointing Harry Potter fans because there is no magic and it is a bit too real. Make sure you enter your review on LT so that it counts for the contest! how do i get my review in the contest? I started this book but I gave up. It was way too graphic for me and I was not enjoying it at all. I was very disappointed in the book. Having read all the Harry Potter books, I would love to win The Casual Vacancy, Rowling’s newly released and first “adult” book. I have read a synopsis and see where Rowling is basing her material from London’s poor side of town from which she grew up. We all have friends from the bad side of town, the bad side of life…and this is IMPORTANT to everyone of every age to experience reality.